The Inverter communicates with the Battery Control Unit (BCU) located in the Power Electronics Carrier (PEC) and the Hybrid Control Module (HCM) on the Controller Area Network (CAN) high-speed proprietary data link. The data link is a two wire twisted pair with two 120 ohm resistors located in the link. Fault Code 88 will only be set with Hybrid Control Module (HCM) software level 663 and lower. HCM software 671 and greater will set a fault code 111 for the inverter CAN message fault. • HCM ignition voltage is greater than 7 volts and less than 16 volts. • HCM CAN Data Link fault is not Active. • FMI 9 is set when the HCM has not received a Inverter message for 30 consecutive message cycles. • FMI 2 is only Active in Product Diagnostic Mode (PDM) and sets if 3 consecutive Inverter messages are not received by the HCM. • Amber “Check Hybrid” light illuminates. • Electric Motor/Generator Assist and Regeneration are disabled; however, the high-voltage relays will remain powered. 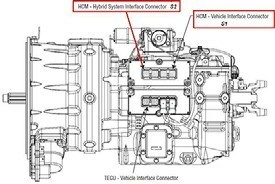 • HCM continues to control the hybrid vehicle in a diesel-only mode. • Transmission defaults start gear to 1st. Only inactive faults can be cleared from the TECU or HCM history using ServiceRanger. The TECU will automatically clear the faults from history after 200 hours and the HCM will automatically clear the faults from history after 200 hours of the fault staying inactive. 1. Retrieve Active fault codes and FMIs with ServiceRanger using the 9-Way Diagnostic Connector. 2. Perform the Electrical Pretest on page 24 and the Hybrid Electrical Pretest on page 28. • If no issues are found during the Hybrid Electrical Pretest, go to Step B. • If issue was repaired during the Hybrid Electrical Pretest, go to Step V.
2. 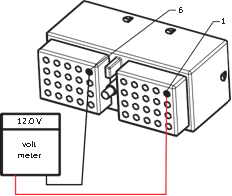 Disconnect Inverter 40-Way Connector. 3. 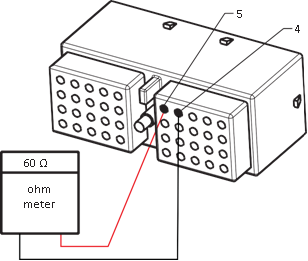 Measure resistance between Inverter 40-Way connector Pin 5 and Pin 4. 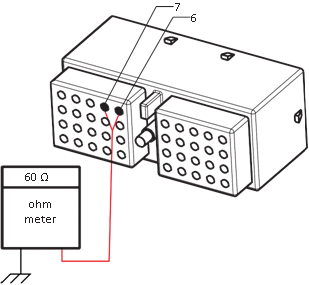 • If resistance is OL or outside 50–70 ohms, repair OEM CAN link harness. go to Step V.
• If resistance is between 50–70 ohms, go to Step C.
C) Purpose:Verify power and ground to inverter. • If either resistance is 0–100 ohms, repair shorted CAN link circuit. go to Step V.
• If both resistances are 7k ohms, go to Step D.
D) Purpose:Verify CAN is populated in correct Connector PIN. • If resistance is 0–0.3 ohms, go to Step E.
• If resistance is 60 ohms, repair CAN wiring (hi and low are wired wrong). go to Step V.
E) Purpose:Verify CAN circuit for short to ground. 1. Key on, with Inverter 40-Way still disconnected. 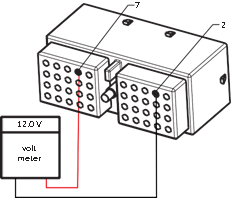 • If battery voltage (12 V +/- 1.2 V) is present, replace Inverter. go to Step V.
• If battery voltage is not present or less than 1.2 V of battery voltage, go to Step F.
F) Purpose: Verify ground circuit to inverter. • If resistance is 0–0.3 ohms, go to Step G.
• If resistance is greater than 0.3 ohms, repair OEM ground circuit to Inverter. go to Step V.
G) Purpose: Measure the resistance between the HCM and the inverter. 2. Remove 38-Way Hybrid Vehicle Interface Connector. 3. 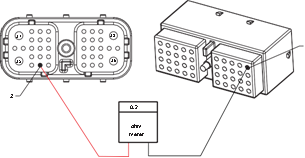 Measure resistance on 38-Way Hybrid Vehicle Interface Connector (S2) Pin 2 to Inverter 40-Way Pin 1. • If resistance is 0–0.3 ohms, replace HCM. go to Step V.
• If resistance is OL or greater than 0.3 ohms, repair OEM harness between HCM and Inverter. go to Step V.
4. Clear codes. See “Fault Code Retrieval and Clearing” on page 13. 6. Check for codes. See “Fault Code Retrieval and Clearing” on page 13. • If no codes, test is complete. • If Fault Code 88 appears, find error in testing, go to Step A.